That's a big one-five there, roger that. 15 miles, bay-bee! Hope everyone had a fantastic holiday! Who's ready for the New Year? 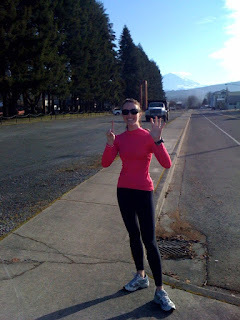 On this morning's schedule was a 15 miler with Tall Mom Mel...which would be my 5th double-digit run and my longest distance yet. My plan was to just do it and stay alive/breathing/moving/etc. The weather was amazing and just like yesterday in terms of clarity. Last time I ran with Mel on this trail it was dreary and foggy, so I had no idea how close Mt. Rainier looked! 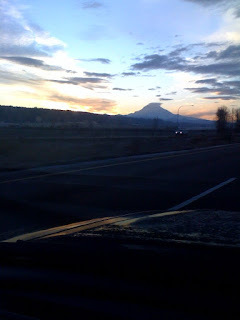 I had to take a early AM picture of it from my car because it was a site to behold. I actually got to the trail start before Mel! Ah ha ha ha! I didn't want to be late like last time because I hate having people wait for me. :) Apparently the temperature outside was not t-shirt weather, and I'm glad I brought my long-sleeved pink shirt to change into before we set off. Duuuuude, it was cold! Thank goodness for the new long running tights I got for Christmas! Cheapy black gloves came in handy too! And my new Dollar Store earmuffs from my mother-in-law were perfect...I need to invest in about a dozen more and give them away (stay tuned!). This trail run was no different from last time when it came to animal sightings. We saw a poor cow on the wrong side of the fence just moo-ing her little heart out for help. There were blue jays (I think), seagulls, ducks, geese, osprey, horses, llamas, more moo cows, a dog, a couple kitties and....a freakin' bald eagle! 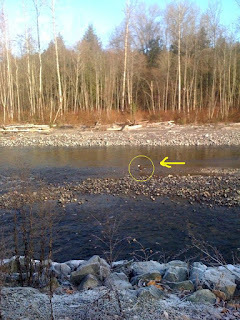 It was just chillin' at the edge of the river just eating a big fish at mile 14. He looked over our way once or twice as we gawked at him and all his glory. It was a great ending to our long run! Eagle says "nom nom nom"
Anyway, jumping backwards to mile 6ish, Mel and I were talking about our little fear of dogs. Well, wouldn't you know, up ahead we saw this big, black mass of an animal and we had a Kerrie moment of "what the hell is that??" Mel: (laughs) It looks like a sloth. Me: That's a huge sloth. Mel: No, wait. It's a dog. 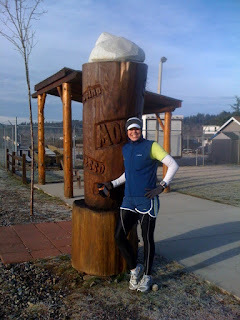 So, one of the big goals on this long trail run is to see the 8 foot wooden latte and you know you've made the halfway point. :) What a sweet little piece of wood that was. Mel was awesome and bought me a very yummy latte after the run. We sat, chatted and came up with many "-athon" jokes and I recommended for her to watch "The Hangover." Then we had to go because it was already after noon (say what?!). But, there was some difficulty standing up from the table. Oh boy! We're going to be sore tomorrow! 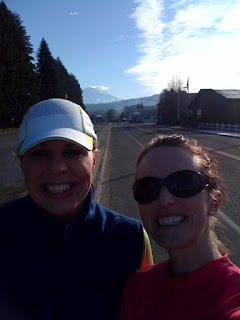 Thank you, Mel, for the opportunity to run a new distance with you! You rock! *Extra points for those Princess Bride fans! Woot! "Rodents of Unusual Size!" Love it!! Hey did you get the pics I sent you?? I have a VERY similar post going up tomorrow.. Great minds and all. FYI you were much cooler than I when approaching the figure in the distance...I was about to turn around..
You rocked that run with zero issues, CONGRATS on the nex PR!! Congrats on setting a new bar for yourself! yay for 15! Sounds like a fun run. We don't see much wildlife running in the suburbs of Virginia. But really, what is that giant latte all about? Too funny! Great job on the 15 miles! I love the wooden latte - need more info on that! I found you from Tall Mom and I love the blog! CONGRATS on your distance PR! I did that two weeks ago and isn't it an awesome feeling! Hi there! Would you mind sharing these this with your wonderful bloggers? 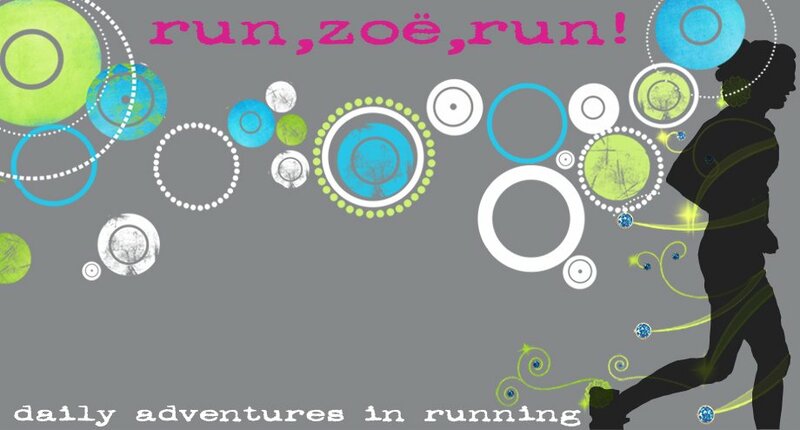 Awwww you girls are so cute and the run looks like fun! Great job on the new distance!!! Wa-hoo!!!! Hey Zoe! I didn't know you and Tall Mom Mel ran together! That's so cool. Both of you are awesome ladies and runners! Glad you saw your shadow! It's been so long since I've seen mine, I'm not so sure it even still exists! Hopefully we'll have more clear skys soon! Dude! More than halfway to marathon distance. You'll totally get there. How did you feel after? In the picture on FB you look fantastic. I would have been red faced and dying! Whoo woo on your first 15 miler!! You're a rockstar. I've got a 15 miler on tap for this weekend--gulp. I'll be running it solo--this should be interesting.